Hello, Bley! Please explain your shop's name to us. Bibliophile means book lover, right? Yes, but while bibliophile is my Etsy username, my shop is called "Bibliosophy," a made up word based on two Greek roots, meaning "the study of books." I have been making art for as long as I can remember, and my days do not feel complete until I have created something. Bookbinding has always had a fascination for me, partly because I love to read books, and partly because I love to create useful things. 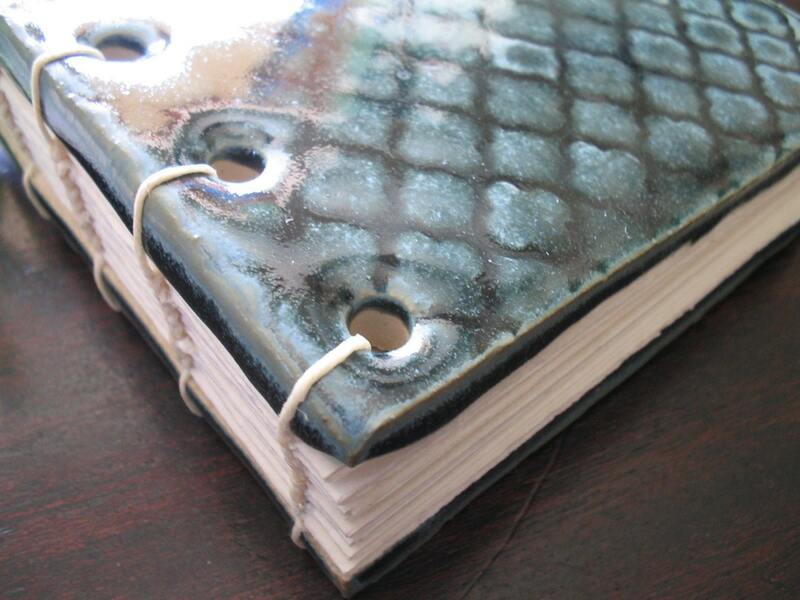 After college I was able to pursue my own artistic interests, and that is when I was really able to focus on binding. What kind of books do you make? What materials do you use and what techniques are your favorite? My work is slowly evolving. I started with Coptic bound books and worked mainly with used children's picture books, turning them into new blank journals. From there, I have expanded to include journals with ceramic covers, journals with used encyclopedia covers (which often have lovely embossed details), and recently I have been working with fabric-covered journals sewn onto leather tapes with a binding of my own devising. I love exposed spine sewings, so I don't work much with case-bound books; I feel that the decoration on the spine is the most interesting part of a hand-bound book. I love to find new uses for blank books and incorporate the use into design features: such as using the oilcloth on the covers of a cookbook to make it more practical in a kitchen. Do you have a specialty product line? My cookbook journals are pretty unique, I think. I calligraphed the interior pages into recipe templates so people can include their favorite recipes and covered the front and back with oilcloth to make it wipe-able and useful in the kitchen. 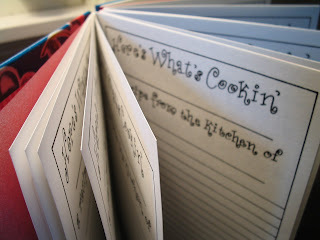 And the Coptic stitching allows it to lay flat so you can easily read your recipe! I am surprised that you don't mention your clay-cover books. I think they are pretty special, and love the idea. Do you make the covers yourself? Yes, I make the clay covers myself, and these are some of my favorite books. The process is much more long and involved because I do not own a kiln myself, and many factors remain out of my control with these. But, when I get the chance to work in the clay studio, I love making sets of covers for future books. Clients enjoy them too; I had one ordered for use as a guest book at a wedding, and others plan to use them for their most special memories. What do you do when you are not making books? I have the best day (and night!) job in the world as the stay at home mom to a one year old boy, and a new one due in March! It keeps me busy, but I love to squeeze my own personal art time in. My formal training was in art history and art education, and I taught studio art for a couple of years. 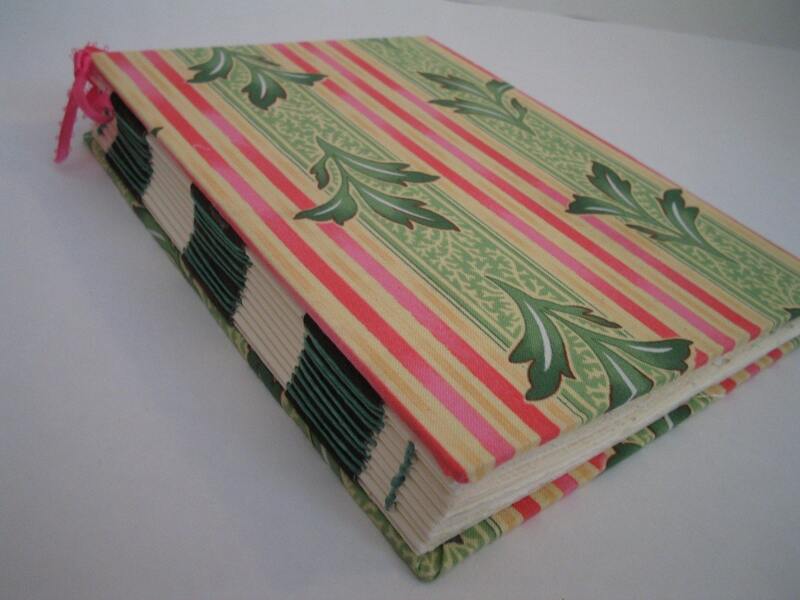 I became interested in bookbinding after graduating from college, and am largely self-taught. I would love to attend some historical bookbinding workshops someday as my family allows. I intend to keep learning new binding styles and creating books, but my focus has shifted a little since starting a family, and I am starting to do more portable crafts, such as knitting, which I can more easily squeeze in between family demands. 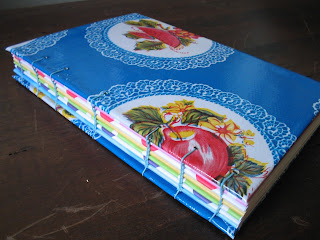 You can check out my blog, http://bibliosophybooks.typepad.com, to see some of my sewing, knitting, and bookbinding tutorials. Bley, you have such wonderful and smart ideas! I've just been reading your blog and loved all of the many creative projects you've posted. I love your work! Your recipe books are just great. I also am juggling being a stay-at-home with making art. It's pretty crazy! I can't wait to read your blog. Lovely books! I <3 your clay covers, they look fabulous! Thank you all very much! It was an honor to be interviewed!